Who's behind the disappearance of five Hong Kong booksellers? 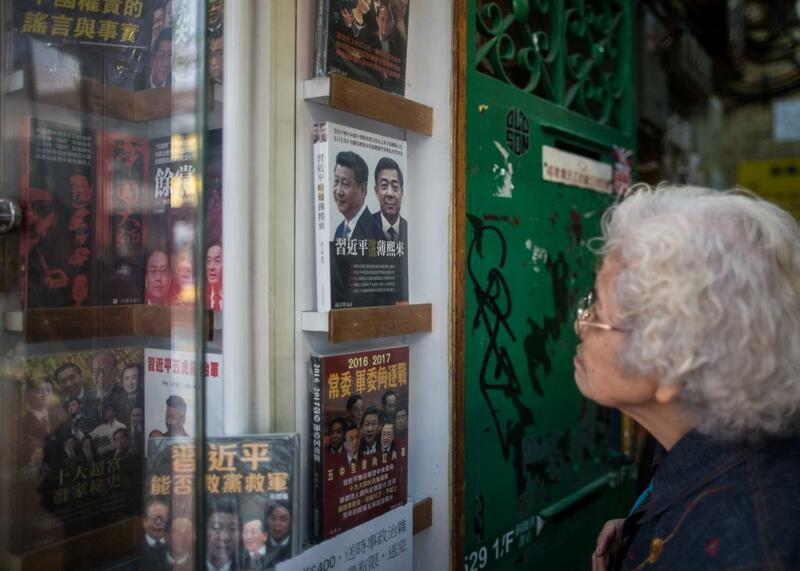 An elderly woman examines a book cover featuring Chinese President Xi Jinping and former political heavyweight Bo Xilai at the Causeway Bay Bookstore in Hong Kong on Jan. 2, 2016. One by one, people associated with a controversial Hong Kong bookstore have been disappearing. The mystery of how and why has raised fears about freedom of speech in the semi-independent Chinese enclave. The Causeway Bay Bookstore specialized in what the Guardian calls “thinly-sourced, tabloid-style political books” and proudly touted “banned in China” titles like The Collapse of Xi Jinping in 2017 and The Inside Story of the Big Explosion in Tianjin. These gossipy books, focusing on official corruption and the personal lives of senior Chinese officials, would never be permitted in mainland China. Hong Kong is formally part of China, but under the “one country, two systems” arrangement in place since Britain turned over the colony, Hong Kong has a separate legal system, including protections for a fiercely independent and raucous media. The store’s titles were popular not just with Hong Kongers but also with mainland tourists who can’t get this kind of thing at home. The first person to disappear was Gui Minhai, the owner of Mighty Current, the publishing house that partly owns the bookstore, who disappeared from a resort in Thailand where he was vacationing in October. Then three more members of the shop’s staff went missing during visits to the mainland later that month. Then on Jan. 1, Lee Bo, part-owner of the store, went missing. His case was even more troubling, as it apparently took place in Hong Kong itself. After his disappearance, he called his wife, sounding rushed and stressed, saying he was in the southern Chinese city of Shenzhen. Several days after that, she withdrew her request for police help in finding him after his colleagues received a handwritten note saying he had traveled to China by his own means to “cooperate with an investigation.” This is all extremely suspicious; there’s no record of Lee passing through immigration, and he was not carrying any travel documents with him when he disappeared. The Washington Post notes that in China, “cooperating with an investigation” is often used as a euphemism for police detention. So what happened to the booksellers? Some believe that powerful mainland figures targeted in one of their store’s books organized kidnappings in cooperation with the Chinese mafia. But many in Hong Kong’s pro-democracy movement believe the Chinese government itself is behind the disappearances. There’s some speculation that the case is related to a forthcoming book on President Xi Jinping’s love life. “We have strong reason to believe Mr. Lee was kidnapped and smuggled back to the mainland for political investigation,” said Albert Ho, a lawmaker from Hong Kong’s Democratic Party. The disappearances come at a time when many Hong Kongers feel that their political independence and civil liberties are under threat from Beijing. In 2014, mass protests were sparked by the Chinese government’s proposed changes to the city’s election laws, which would have all but ensured Hong Kong staying under the control of pro-Beijing leaders. There has also been a troubling rise in the number of attacks and threats made against journalists and publishers in the city. In December, Chinese Internet giant Alibaba bought Hong Kong’s most influential and respected English-language newspaper, the South China Morning Post, motivated in part by a desire to combat what executives said was a “negative” portrayal of China in the Western press. The government may need to come up with a more substantial response soon. Gui was a Swedish national and Lee was British, and those governments are expressing concern over the case. Even the normally acquiescent pro-Beijing faction in Hong Kong is starting to ask for answers. The abduction of a handful of irritating bookstore owners—which, by the way, has made them several orders of magnitude more internationally famous in the process—seems a bit crude for China’s central leadership. But someone powerful clearly decided the store had gone too far. With Beijing’s current economic jitters and an ongoing corruption crackdown targeting some of the president’s most powerful enemies, skins may be thinner than normal. And whoever’s behind it, the chilling effect is working. Other Hong Kong bookstores have started pulling titles banned in the mainland from their shelves.